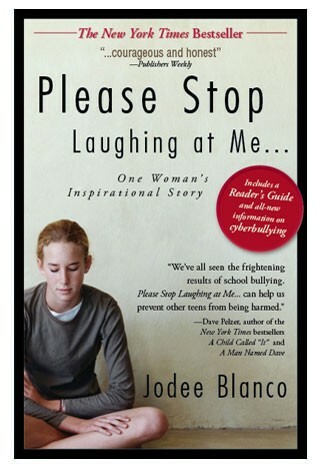 Please Stop Laughing at Me is about the young women Jodee Blanco. This book is written in a first-person point of view and is a true story. Jodee was popular until 5th grade, which at that point everything kept going downhill. Everyone who she thought were her friends back stabbed her. She transfers schools and it stops, but after a party (that she crashed) it all started back up. Jodee and her family then decide to just move to a new location. That does help, until summers over, then she is backed stabbed again. If you would like to figure out what happens in the end, read the book for yourself. Jodee Blanco: The character that writes the book/whose point of view that we are reading from. Annie,Bill,Dino,David:Friends that Jodee made in highschool and the ones that didn't back stab her. There are many more characters, but almost all of those other characters are bullies or weren't mentioned very often. I am pretty sure the theme to this book is even if you get hurt now think about the future and what that is to you. The reason that I think that is because in the Jodee ended up being successful in life, thanks to those who bullied her, and that when the time came she didn’t think about the bullies, but the future and what she has planned for it. In my personal opinion this is a really good book. I would recommend this book to anyone 13 and over, only because this book has some things that I don’t think parents would want their 8 year old reading. I would definitely recommend this book to those who are getting bullied and to those who are the bully, just so they can know how the ones they bully feel. Out of a scael of ten, I would rate this book a 8.5. Blanco, Jodee, and Jodee Blanco. Please Stop Laughing at Me: One Woman's Inspirational Story. Avon, MA: Adams Media, 2003. Print. "It's NOT Just Joking Around! 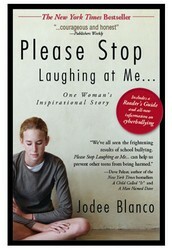 - A Survivor's Guide to Joking and Peer Abuse :: Jodee Blanco." It's NOT Just Joking Around! - A Survivor's Guide to Joking and Peer Abuse :: Jodee Blanco. Web. 04 May 2016.